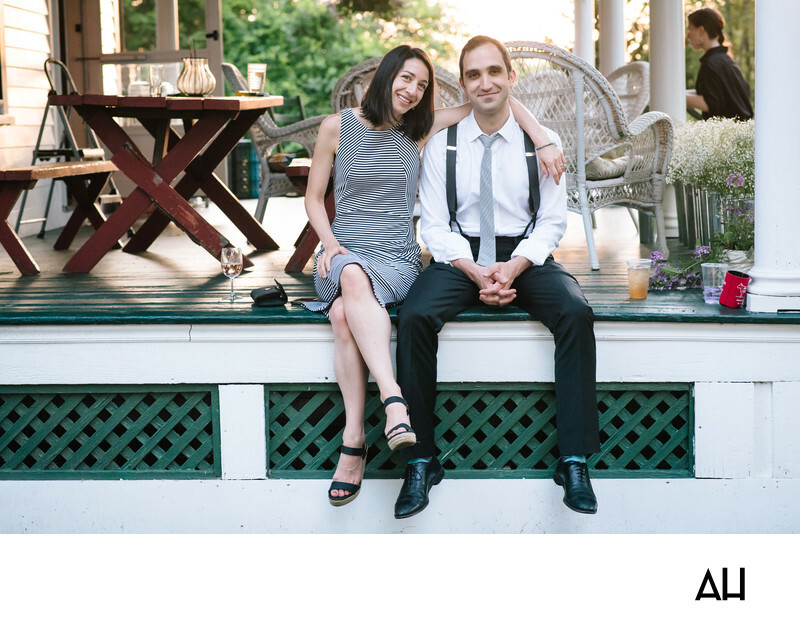 This image shows a couple attending a New Haven Wedding, captured by the Best Wedding Photographer in Connecticut. The couple sit on the porch of a private residence, enjoying the casual cocktail hour and reception hosted here by the newlyweds. The backyard wedding reception was a charming, yet chic event that the couple planned to specifically fit all their wedding day dreams. Having a private residence wedding allows couples to make their wedding day wholly their own, and they are able to arrange all aspects of the day to fit their individual personalities and desires. Only the Best Wedding Photographer in Connecticut can capture all of the delightful, joyous moments that make up a wedding event such as this. This picture shows the carefree, fun feel that permeated this day. The two guests smile at the camera in a good-natured manner. The man sits on the green painted porch with his legs swinging over the edge. He wears dark suit pants, a dress shirt, and suspenders. He has long since abandoned his jacket, and his sleeves have already been rolled halfway up. Just above his dress shoes, teal socks peek out. The woman who sits beside him has her arm flung over the shoulders of her date. She shares his smile, and while the image is casual, the pair still look ready for a magnificent wedding celebration. The porch scene behind them glows in the natural light of the late afternoon sun. It is a perfect Connecticut summer day, and a lovely day for a wedding.